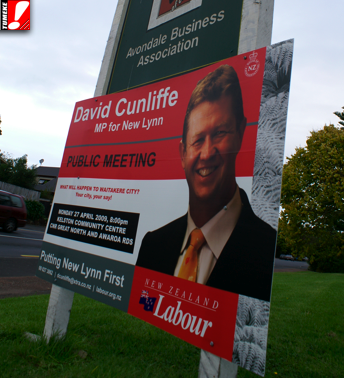 Cunliffe and co. were out West on Monday, and tonight the war drums against the Nactional government's super city plans were beating at the London Bar on Queen Street where the young activists were treated to Manukau City Mayor and great left hope, Len Brown. I had to shoot away after the main address so I can only comment on that part. Secondly, the trenchant claim/belief/mantra that at-large Council seats will benefit the right was given a lot of repetition by various speakers including Brown. That is only true if you accept that as a political idea and as a political machine the left will lose. It is a defeatist and fearful attitude. All the stuff about diversity with ward councillors is confused and I doubt that playing out the scenarios of even 25 councillors on a purely ward-only basis will provide any more or any less diverse representation than an at-large system; especially if there were 9 or more on a ticket basis the way they do in London (11). Rodney Hide says 8. The right are trying to talk him down on those numbers and get more ward councillors - why? Because that is how they will win. So why would the left be helping them promote that agenda!? - because they are dumb, fearful and disunited. The mandate and cohesiveness of people elected by all to serve all is disturbingly irrelevant to the left it seems. The left should be lobbying for more than 8 not less or none. What he is saying - if you look at the statements - is that the left cannot put up a fight, does not have the activists, the money or the will, or the unity to campaign on a single ticket and best the demonised C&R Remmers crowd. It's a gutless call in many respects. 2. That public assets should remain in public ownership. Silence. In the old days, the lefties would be applauding this stuff with great enthusiasm - not today. Was it because Len Brown was saying it? Was it because the left couldn't care less and does not see the dangers? 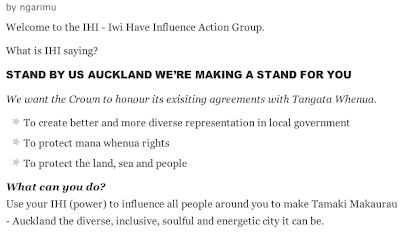 A few lefty Auckland City Councillors were present as were Labourites/unionists but whether because they think it is safe or whether they think Len Brown shouldn't be the one carrying the message it bodes badly for the left for them not to be acknowledging some of Brown's better concepts. Len Brown was fired up but the university, inner-city, Labour cliques remained uninspired. He was beyond suburban - he was provincial - in his language, presentation and with elements of his ideological pragmatism. This did not impress. They also probably would have appreciated some concrete sorts of policies - I sensed that was an expectation - and instead we got a weird sort of passionate redundancy speech as mayor of a soon to be disestablished entity. He had so little impact that some prick near the leather couches in the Tory-looking section of the lounge successfully managed to cut him off by applauding as he was in the middle of concluding. That was enough to say he did not properly command the room. He needs a lot of work to run against Banks for the top job. Since I cannot find Michael Cullen's valedictory speech on You Tube, here is his a grainy video of an address to a Drinking Liberally in Wellington last year. On social democracy and the right. This is a really strange take, Tim. The people I talked to afterwards were really impressed with Len's presentation and the points he made. The public ownership bit is obvious as is, I hope, the fiscal responsibility point. It wasn't intended to be a campaign rally... and it didn't have that kind of energy. 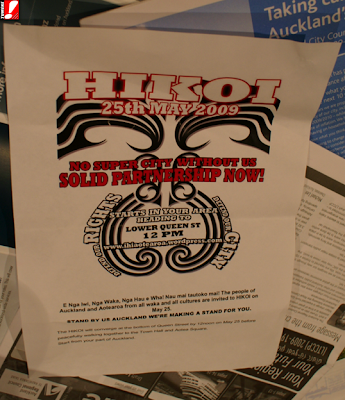 Have you been to other Auckland DL events? The tone and the response was similar, I thought. That was the first time I had been to a DL - so I cannot judge how it was compared to others (the concept is a very good one however and I was impressed with the turnout). But I can compare the reactions he got to the different points he was outlining. Some met with approval and applause - some did not. I have focused on two points that did not. My criticism is that the left cannot take these things for granted and any complacency will be electorally punished. I stand by my observations. Perhaps it was unfair of me not to go into all the other points that did meet with support - but I did not take notes and he did cover a bit ground. He did have some incisive points and many Aucklanders would agree with much of what he said. Hmmm, I'm not sure we were at the seem meeting. The feeling I took away was that most of the crowd were impressed by his passion, and by the points he made. I think Jordan's point about the nature of these events is important. DL is not a rally, it is a forum for assorted lefties to hear ideas, and think about them. Personally, I really enjoyed Len's address. Some of your criticisms of him are valid. He did come across as somewhat suburban, but most of Auckland is suburban. If we cannot appeal to people in the suburbs, then we are sunk. If Len cannot appeal to the TV audience then the left are sunk. What I saw last night was a passionate, genuine, sincere, honest, caring, pragmatic, working class man of the Left - I'm in no doubt about that. However... what people on TV are going to see is Steve Martin playing the role of an unsophisticated - but adorable - hokey corn-belt character and I'm telling you that if he doesn't work on undoing those presentation aspects Banks (with all his many faults) will send him straight back to Arkansas at the Mayoral elections. I too feel like you were at a different meeting Tim. Yes Len's speaking style was a bit naff at times, but I felt like he got away with it, and his passion was pretty clear. He shied away from confirming that he was going to run for the super mayoralty, and it wasn't that kind of event - far from being a campaign launch. I haven't been to all the DL events but at the others I have been to I've never heard so much spontaneous clapping from the crowd as I did for Len. It's usually quite a reflective atmosphere so you wouldn't expect much audience response other than laughing at jokes. Julie - the guy needs some work. As for audience reaction and the spontaneousness: I was judging what did and did not seem to spark the enthusiasm and support of the group. Do you have pictures? I thought I saw you snapping away.